Do a lowly sergeant and a female psychiatrist have what it takes to prevent a nuclear holocaust? You’re about to find out in this gripping thriller from bestselling crime writer Paul Levine. 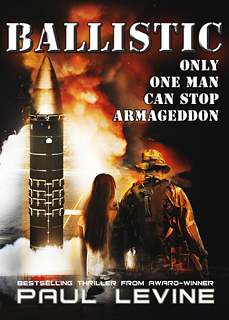 In Ballistic, the future of the world is at stake when a doomsday cult hell-bent on bringing about Armageddon captures an ailing U.S. Air Force missile base. Ballistic is set against the real-world findings of the Air Force that an alarming number of missile launch officers are suffering from boredom, burnout, and some are even cheating on routine preparedness exams. The greatest disaster in the history of mankind is imminent. With morale and discipline suffering as a nuclear arms treaty forces the disbandment of the base’s missile squadrons, a home-grown horde of heavily armed religious commandos led by Brother David moves in. His mission: to realize Armageddon as prophesied by the Book of Revelations. Sergeant Jack Jericho is haunted by an act of cowardice in his past. Dr Susan Burns is a psychiatrist trapped in the launch control capsule during routine missile crew tests. Will the pair be able to work together and battle their own demons to defeat these religious terrorists once and for all? "Ballistic" is ‘Die Hard’ in a missile silo. Terrific!" "Imagine Paul Levine channeling Tom Clancy but with a sense of humor and far, far better writing." "It's easy to compare Levine to Tom Clancy but I think he's better for two simple reasons—he's a better storyteller and his characters are more believable, good guys and bad guys alike."